Barton Rovers made comfortable progress to the second round of the Southern League Cup after a comprehensive victory over Dunstable Town on Tuesday night. Visiting manager Tony Fontenelle made a number of changes, including the return of keeper Jamie Head, who made three magnificent point blank saves, while Rovers included a number of ex-Blues, including Danny Hutchins, Connor Calcutt and Jason Blackett. The hosts began better as Hutchins shot wide, with Dunstable’s chances falling to Kelvin Bossman, who saw keeper Aaron Fulton quickly off his line. Rovers’ Bamford fired over the top, while Blackett’s effort drew a decent save from Head, before the Town custodian made a fine double stop to keep the score goalless. Barton then went ahead on 25 minutes, with Bamford finishing emphatically, while Blackett made it 2-0 on the half hour from an incisive move. David Longe-King found Kelvin Bossman who shot into the side-netting, as Barton came close when Bamford’s downward header was narrowly over. After the break, Rovers had a goal disallowed for offside, as Jack Keating threatened a third, before Sean Coughlan put a great chance wide after an error from Head. Coughlan had a header saved by Head at the expense of a corner, with the keeper then making a superb reaction stop from Jimmy Hartley, as Dunstable’s only real opportunity came when Ashton Grant’s was saved by Aaron Fulton. Connor Calcutt’s header drew another fine stop from Head, Alex O’Brien shot over, before Coughlan’s long range attempt flew into the net, while in stoppage time Hartley completed the scoring after Head had spilled his first effort. Barton: Aaron Fulton, Danny Hutchins, Charlie Smith, Lee Close, Darren Locke (Steve Gentle), Paul Andrews ©, Jack Keating, Alex O’Brien, Jason Blackett (Connor Calcutt), Josh Bamford (Sean Coughlan), Jimmy Hartley. Subs not used: Jordan Wynter, Rod Orlando-Young. 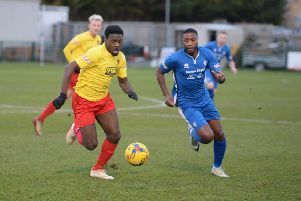 Dunstable: Jamie Head, Anthony Leslie (Jack Hutchinson), Joseph Debayo, Ashton Grant, John Sonuga, Jordan Odofin, Jetmir Esso, David Longe-King, Kelvin Bossman, Adam Moussi, Wilson Ferreira (Ryan Young 45). Subs not used: Danny Talbot, Jack Smith, Alex Cathline.